This Week’s Bingelist is a stream-worthy entertainment guide featuring the best content from across the web that can be enjoyed wherever there is an internet connection. * A note of thanks to PARAMOUNT PICTURES for providing a copy of BOOK CLUB for the purpose of review. BOOK CLUB is about a group of lifelong friends who decide to turn their love lives upside down when they read a book, that I’m sure you’ve heard of, Fifty Shades of Grey as a part of their book club. Anyone that has read or just given Fifty Shades of Grey a glance can probably guess that what is discussed in this book club sparks some pretty interesting ideas these women want to give a try with their own partners. Iconic Hollywood stars Diane Keaton, Jane Fonda, Candice Bergen, and Mary Steenburgen spice things up in the movie BOOK CLUB which is now available on Blu-Ray. Not only are these women relatable and funny but they also show what friendship truly is all about. Get your hands on a copy of BOOK CLUB and call up your friends for a girls movie night this weekend. Grey’s Anatomy Season 14. Grey’s is one of those shows that I’ve loved for years. I love all of the characters and am continually amazed with what Shonda Rhimes comes up with. I honestly didn’t think I would still be watching after one of my favorite characters was killed off of the show, but here I am, just finished bingewatching Season 14, looking forward to seeing what Season 15 will bring next year. Couple’s Therapy with Candice and Casey. If you are a fan of Casey Niestat, you’ll love this podcast with him and his wife. I love how they discuss real marital issues. They are open and honest. Listening to their podcasts feels like you are hanging out with friends. I love Jack‘s video editing style and his overall energy. He seems like a fun person and I think it is pretty awesome that he is the CEO of Patreon. I am loving Shane Dawson’s new spin he has been doing to his channel with all of these series collars with other popular youtubers. I’ve been watching both Shane and Bunny since the early days of youtube. So it is interesting to see a different side of them. Anyone else a fan of Bohemian Rhapsody? This movie looks like it is going to be SO good. I love that they picked Rami Malek to play the lead, I have loved him as an actor because of the show Mr. Robot. Scribd is by far my favorite platform for books and audiobooks because they are back to offering UNLIMITED reading of BOTH books and audiobooks for just $9 a month. This “Netflix of Books” is an incredible value if you love to read or don’t have time to read but want to start listening to more audiobooks (like I am). I love listening to audiobooks through the Scribd app with headphones on while doing housework or through a bluetooth speaker in the shower. Listening to an audiobook while doing something that needs to get done around the house is my favorite way to read. This month, I stumbled across the comic book Quiet Girl in a Noisy World by Debbie Tung on twitter. I was so happy to see that Scribd had this book available. I am a complete introvert in every sense of the word. Most people don’t understand me and the idea of hanging out in groups can induce a panic attack. I couldn’t help but nod my head in agreement with every page I turned. This book is perfectly introverted. If you are introverted and finally want to read a book that is about you or if you love someone that is an introvert and want to know what their world is like I encourage you to pick up this book. Dear Workplaces, Churches, And Schools, PLEASE Stop Doing Icebreakers. Signed, Introverts. I decided to start sharing some of my favorite music each week. If interested, you can follow me on Spotify or give one of my playlists a listen: “Mixin’ it Up!“. This playlist is where I typically add all of the new music I find first. This week I’m trying to enjoy the last bit of summer by consuming any and all fruit that I come across. I’ve been particularly obsessed with watermelon and cantaloupes. 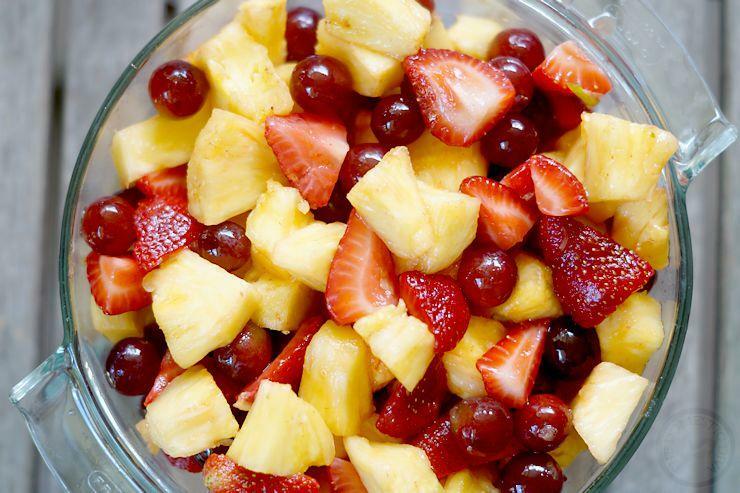 I love making the boys and I a big bowl of fruit salad. This summer fruit salad is a sure to be a crowd pleaser with a brown sugar lime dressing that’s so easy to make. Issue #01: The Crown, Victoria, Alias Grace, and more! Disclosure: PARAMOUNT PICTURES provided a copy of the movie BOOK CLUB for the purpose of review. I absolutely cannot wait for Bohemian Rhapsody to come out! I have loved Queen since I can remember and I love a good biopic so I’m more than ready to see that movie. Doesn’t it look like it is going to be incredible, Ann? This is definitely one to look out for. I’m so excited for Bohemian Rhapsody to come out! Though I will admit I’m a little cautious, I’m praying they don’t mess it up! My four year old used to only fall asleep listening to Queen! Oh how cute, about your little one. *fingers crossed* they do Queen justice. Haha, no doubt Grey’s is one of the greats! I am dying to see bohemian raphsody!!! Seriously it looks amazing. I have heard good thongs about book club and hope I can catch it as well! Thanks for the reviews! This issue of bingeworthy media did not disappoint! I’m super excited to see both Book Club and Bohemian Rhapsody, they both look excellent. This issue of bingeworthy media did not disappoint. I’m super excited to see both Book Club and Bohemian Rhapsody, they both look excellent! Grey’s Anatomy is one of my favourite Tv shows. You should definitely watch it. I loved the season 14. Book Club sounds a fun movie to watch. ? I am so not up to date on what is out, or good these days and love your blog. It keeps me “in the know”. This is the first time I have seen anything about Bohemian Rhapsody but your right! It does look good. I’m excited to watch it. I think we are not necessarily introverts. I think we are sane, sober adults that are surrounded by a lot of very immature people that somehow thrive on loud, obnoxious behavior. Or, perhaps we are all the same but they drink to cope. I have noticed that the only way anyone can stand hours upon hours of “visiting are those that have been drinking. I truly enjoy the first couple of hours when it starts getting loud, people are slurring and becoming laughing hyenas, it”s time to leave and I do. However, I find I never really look forward to these parties because we try to cram too much in one day. My problem is doing too much. Christmas Eve, a brunch at my family”s home, a dinner at husband”s family”s home and the next day (Christmas) at our home with our children and their spouses. All of us are invited and “expected to attend to both! We all live relatively close, so not even a lot of driving. It”s just too much. This year, my adult son said, “Mom, two parties in one day and one the next? Sorry, I can only do one party and I”ll come to yours. That is Wisdom, not being an introvert. Next year, I will tell my loved ones the same thing. Sorry, I can only handle one party. You are welcome on Christmas Day let me know if you can make it by such and such a date and I know I will feel welcoming and ready to see them. (After a couple of hours, when the giddiness and slurring start, I guess I can handle it knowing it will be over soon. Some things we have to cope with. My wife and I love Grey’s Anatomy. I think we’ve probably watched the series at least four times now on Netflix and it never gets old. We’re excited for the new season! I love Grey’s Anatomy this tv series is one of my favorites. Very nice stories that you don’t want to missed. Grey’s Anatomy has always been my favorite series, never missed an episode. I just saw that the series is available on Netflix :-). Excited to watch it. I am excited to see Bohemian Rhapsody! I have been a fan of Queen for the longest time and it was awesome to have a movie around one of their greatest hits.